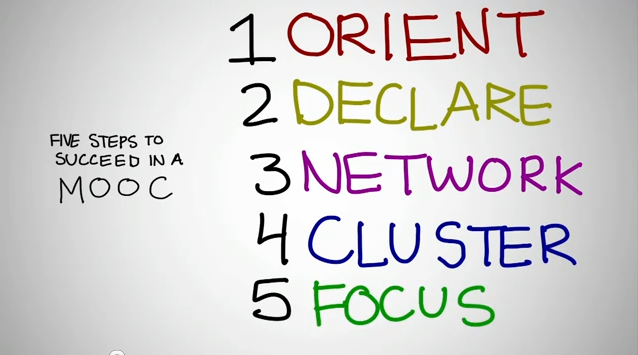 This Youtube video from Dave Cormier offers advice for students enrolled in MOOCs. Like the Searls commentary I wrote about yesterday, Cormier’s video emphasizes the role of the learner’s effort in getting the most out of online classes. Cormier’s approach is definitely directed at students in MOOCs of the connectivist variety, where student interaction might take place outside a traditional Learing Management System. Many of the MOOCs that use the connectivist approach have centered around professional learning communities (often in the field of education) rather than novice learners. However, there are clearly plenty of lessons in the video for those of us learning Python via the Mechanical MOOC. I’ll explore how to apply each of Cormier’s steps to the mMOOC in several posts this week. This entry was posted in MOOCs and tagged Dave Cormier, learning, mMOOC, MOOCs, networking, YouTube. Bookmark the permalink.